It is that time of year that we need to prepare for registration for Cub Scout Day Camp! Day Camp is a week-long day camp opportunity for Cub Scouts. The camp is held in Westminster. There are two sessions – one in June, and one in July. The Cub Scouts will have an opportunity to shoot BB guns, practice their archery skills, earn advancements, and have tons of Cub Scout fun! Diane Wolf is coordinating the Pack’s registration process. If you do not complete all forms (fully) and give the payment to me by the deadline, the Carroll District will add an additional $30 fee for each registration. District will not accept any forms (even with late fee) after March 8th, except for NEW Scouts or registered Scouts transferring into Carroll District. Please note that I am just collecting all the paperwork, payment and handing it in – it is YOUR RESPONSIBILITY to have all the completed information and forms done and given to me. The Pack is not going to be responsible for any rejections or late fees from the District. Please do not wait until the last minute do this. District is firm with the late fees and all deadlines. Day Camp is a lot of fun and well worth the cost. I have attached the following forms that give all the general information, Scout registration, adult registration, junior camper registration, and medical forms. Forms can also e found on the Carroll District website www.bsacarroll.org. At our December Pack Meeting, Cub Scout Pack 883 collected 117 lbs of food for the Carroll County Food Bank. Ira Seidel delivered the food on Saturday! Thank you to all Cub Scouts and families who donated to this worthy cause. Pack 883 continued our successful recruiting program this year - we recruited 27 new Cub Scouts this Fall! In addition, by retaining more than 90% of our Cub Scouts, our Pack registered a total of 74 boys for the 2010/2011 Cub Scout year. We are pleased to welcome our new Cub Scouts! Thank you to Bill Wolf, our Recruiting Chair, and to each of the Cub Scouts who recruited a friend or family member to join Pack 883. 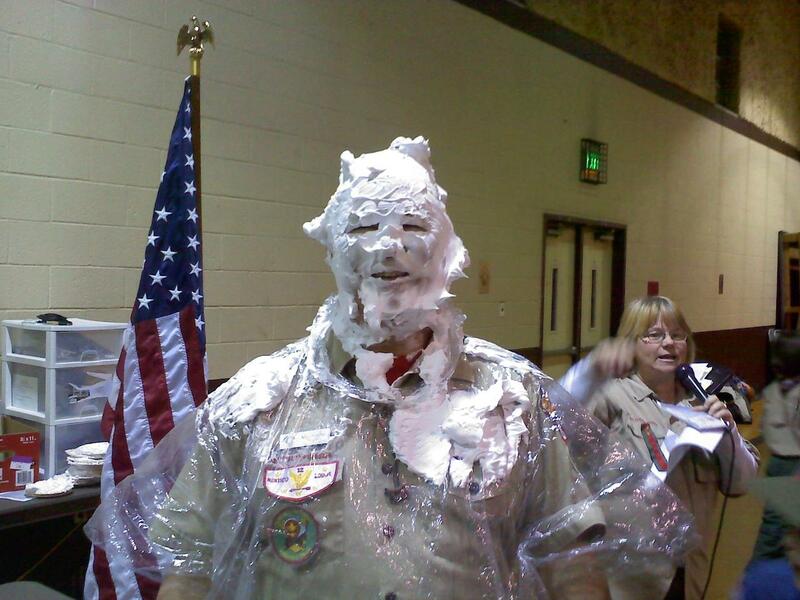 The highlight of our recruiting effort was our annual ”Cream the Cubmaster” event at our December Pack Meeting. Cub Scouts who recruited a boy who joined our Cub Scout Pack each got to throw a pie in the face of the Cubmaster – I may never get the shaving cream out of my ears! We are eagerly preparing for the Pinewood Derby to be held at St. Joe’s Catholic Church on January 22, 2011. This Pinewood Flier provides all relevant details necessary to build your car and be on time for the race. We will continue our Family Pinewood Derby this year. See this flier for details. If you have any questions, please don’t hesitate to contact Howard Taylor or Kevin Kalmbach. B y Decree of the King, all Cub Scouts and families are invited to draw near and gather together for a special celebration of the Scouting program at our annual Blue & Gold Banquet. All Cub Scouts who follow the Law of the Pack and the Cub Scout Promise will be knighted as members of the Royal Order of Akela, and those who are worthy will be sent on a quest to find the lost gems of the realm. Upon returning from their quest, the brave (and famished) knights will be honored at a feast in the Great Hall with their parents and family members in attendance to laud their accomplishments. Special activities will occur during the meal to entertain the loyal knights, including an amazing display of swordsmanship. Finally, many of the knights will finish their rank advancement requirements in advance of this grand celebration, and those knights will be singled out for their noble accomplishments. Pre-registration is required. No late registrations can be accepted. Please fill out and return this registration form and your payment to Ami Gregor by 5:30 PM on Monday, January 31, 2011. In the event you have not turned in your registration and payment by this date, you will not be included in our catering count, and you will not be able to eat with the Pack. The Blue & Gold Committee is also looking for some additional helpers. Please contact Ami Gregor (rhaille2@yahoo.com) if you can help!